Allow me to congratulate you on your election as President of the 67th Session of the General Assembly of the United Nations and express my delegation’s support to you in discharging your duties. I also wish to express my sincere appreciation to your predecessor, H.E. Mr. Nassir Abdulaziz Al-Nasser, for the excellent way in which he conducted the work of the 66th Session of the General Assembly. I would like to take this opportunity to thank the Secretary General for his report on the work of the Organisation. Cyprus, due to its geographical location and historical ties with its neighboring countries is following closely and demonstrates particular interest in developments in the broader Middle East and North Africa over the past 18 months. The sovereignty of the people was and remains a fundamental principle of organization and functioning of states. As the international community, in our opinion, we should address the events through this prism, respecting the right of each people to determine its own future. During this period we have witnessed transformation in Tunisia, Egypt, Yemen and Libya. We stand by them through this transition and encourage their efforts on the difficult road to consolidating democracy and the rule of law. We look forward to new structures that are inclusive of women and minorities and create conditions for further participation of citizens in political life. It is with great sorrow though, that we are witnessing the loss of human lives. Increased violence in Syria continues and potential spillover effects to neighboring countries are a great cause for concern. We strongly condemn the violence and the massacres of innocent civilians in Syria and call for their immediate cessation. There is undoubtedly a humanitarian crisis that needs urgent attention. Recent consultations at the Security Council gave emphasis to this. The Republic of Cyprus stands ready to contribute to international efforts to manage the crisis, for the additional reason that the “fire is raging outside our door”. We remain committed to respecting the sovereignty and territorial integrity of Syria and emphasize that the continued violence and its recent intensification stresses the need for a political solution. In this respect, I join the rest of the international community when expressing unequivocal support to the newly appointed Envoy to Syria Mr. Lakhdar Brahimi, with the sincere hope that he will help bring the conflict to its end. Against this background of significant changes in the region, the Middle East Peace Process continues to be at an impasse. It is imperative to resume negotiations, which will eventually lead to the implementation of Security Council resolutions and the establishment of a free and independent Palestinian State, based on the pre-1967 borders. The solution must, at the same time, address the legitimate security concerns of Israel. No viable solutions can be achieved in the absence of political dialogue. As you wisely proposed upon your election “adjustment or settlement of international disputes or situations by peaceful means” is the overarching purpose of the United Nations. It nevertheless also remains a timeless challenge; and I can personally attest to this. Cyprus still faces the consequences of foreign intervention and of the Turkish invasion and occupation. More than one third of the territory of my country is still under military occupation by Turkey; a fellow member state of this revered Organisation. Our participation to the UN requires engagement in the struggle for the protection of human rights. We share a “commitment to the rule of law” and we are proponents of peace and security in the world. Yesterday, we committed to the Declaration of the High Level Meeting on the rule of law, affirming the sovereign equality of States and respect for their territorial integrity. Yet Turkey, after invading Cyprus in 1974 continues to occupy, for 38 years, the northern part of the island, maintaining a strong military force and continuing the mass transfer of settlers from Turkey, pursuant to its policy for demographic alteration of the population of my country. Turkey continues to violate human rights and fundamental freedoms of tens of thousands of displaced persons, including the usurpation of their property, the rights of the enclaved and the people who lost their loved ones and continue to search for them. 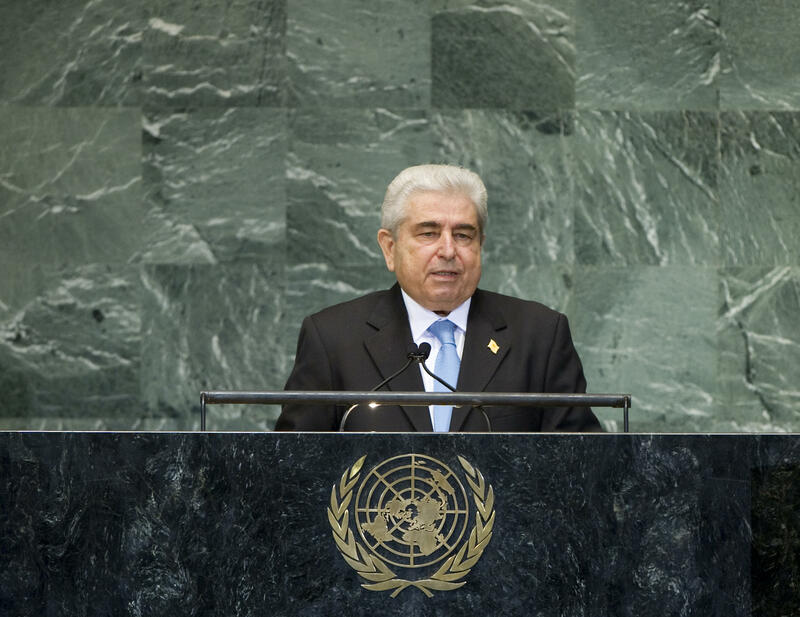 Since the assumption of my duties as President of the Republic of Cyprus in 2008, I took the initiative, in collaboration with the UN Secretary General Mr. Ban Ki-moon, to end the stalemate and start a new process of direct negotiations with the then leader of the Turkish Cypriot community, Mr. Mehmet Ali Talat, on the basis of a bicommunal, bizonal federation with a single sovereignty, single citizenship and single international personality. These we had agreed with Mr. Talat. This process commenced under the auspices of the Secretary General of the United Nations and is being facilitated by his Good Offices Mission on the island. I believe that the Turkish Cypriot side, under Mr. Talat, shared the vision for a solution for the benefit of all Cypriots, for the termination of the occupation and the creation of conditions of lasting peace and security on the island. We had then, despite the difficulties posed by the occupation, achieved a number of important convergences. Since 2010, the current Turkish Cypriot leadership under Mr. Eroglu, despite committing itself before the Secretary General to continue the talks from where they left off, it has broken this joint commitment and retracted from all the convergences achieved with the previous Turkish Cypriot leader. In addition, since last March, the Turkish Cypriot leadership with the support of Turkey, in response to the assumption of the Presidency of the Council of the European Union by the Republic of Cyprus has abandoned the negotiations. On our part we remain committed to Resolution 2026 of 2011 which provides that an accord on the internal aspects of the Cyprus problem must be achieved before convening an international conference with the consent of the two communities for the international aspects of the problem. Our commitment remains unchanged. Return to the negotiating table, continue the negotiations in good faith, to respect in practice and not just words the agreed basis for a solution of a bicommunal, bizonal federation with a single sovereignty, single citizenship and single international personality, with political equality as defined in the relevant UN Security Council Resolutions. We are grateful to the Secretary General, who, despite the many challenges this International Organization faces he willingly devoted time and effort having invested to this process. I call on the Turkish Cypriot leadership to return to the table and to share our vision for a united and peaceful Cyprus. For a solution to the Cyprus problem to be achieved the support of all concerned parties is vital. Turkey’s positive contribution and practical support for the two communities to take the process forward, is sine qua non. Instead, Turkey has been pursuing “gunboat diplomacy” with oft-repeated display of its military strength around Cyprus. Turkey’s alarming behavior has been escalating since last September when Cyprus proceeded with exploration activities in its exclusive economic zone, within the rights accorded to it by international law and particularly the UN Convention on the Law of the Sea of 1982. Turkey has not signed the aforementioned Convention and does not abide by the relevant customary international law. To the contrary, Turkey engages in unilateral actions in respect of sea areas that are patently beyond any reasonable geographical or legal limits of its own continental shelf and potential exclusive economic zone and clearly falling within the exclusive economic zone and continental shelf of the Republic of Cyprus. Turkey behaves as if the Republic of Cyprus does not exist on the map of the region. This behavior, by a country seeking to become a member state of the EU and a country who is supposedly seeking to have “zero problems with its neighbors” cannot and should not be tolerated by the international community. I call on Turkey, before this esteemed body to cease its provocative behavior. I repeat at the same time that in a reunified Cyprus the natural resources, including hydrocarbons, will be common wealth for all Cypriots, Greek Cypriots and Turkish Cypriots alike. The deadline the international community has set for the achievement of the Millennium Development Goals in 2015 is nearing. We have seen much progress thus far but a lot more has to be done as poverty and hunger persist. Looking beyond 2015 we need to recommit ourselves to a new agenda which will be concrete and aim at poverty eradication, inclusive and economic and social development, environmental sustainability and peace and security for all.